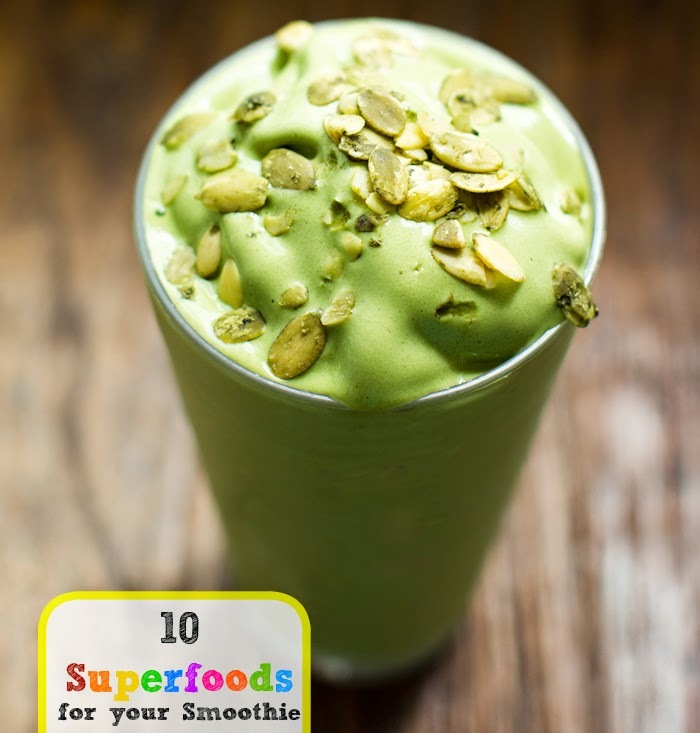 10 Superfoods for Smoothies I am Loving Right Now! VIDEO. Today I am sharing ten of the smoothie add-in superfoods I am crushing on now. You all know I embrace a smoothie-a-day wellness habit. Well one easy way to super-boost the nutrient profile of your smoothie is by adding in superfoods. And just to be clear, I am using the term "superfood" quite loosely. Basically anything that adds some wellness OOMPH to my smoothie, I like to call a superfood. There is a long laundry list of superfood possibilities including things like chia seeds, cacao, moringa, aloe vera, hemp seeds, acai powder, mushroom powder, turmeric, spirulina, protein powders, apple cider vinegar, matcha green tea, camu powder, Ayruvedic herbs, cinnamon, pitaya, cayenne, maca powder and on and on. Just hop on over to the supplement section of any Whole Foods or vitamin store and see what I mean! Well my superfood list changes frequently, but right now, these are ten superfood add-ins I am generously rotating into my smoothies. And this post includes a "fuss-free, aka no-makeup or wardrobe" chat and list, VLOG video! Plus a bonus for 365 Vegan Smoothies book owners! 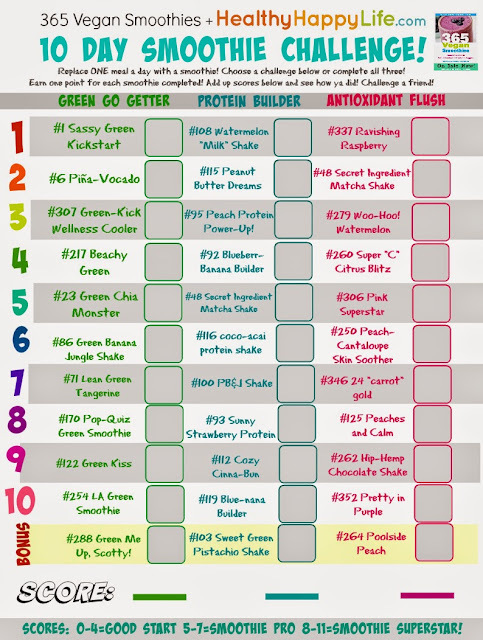 Print out my 10-Day Smoothie challenge Scorecard. Print it out, challenge yourself and friends!.. 2. Matcha. You guys know I love matcha green tea. Well, it has a cozy spot in my favorite smoothies. It adds antioxidant power as well as a Zenergizing boost! Compare brands via my matcha review article here. And get my favorite matcha-approved shake here. 5. Protein Powder. Vegan protein powder is a great way to add nutrient complexity to any smoothie. And smoothies are a super way to boost your daily protein intake! Check out my laundry list of favorite vegan protein powders in my review article here. 6-10? Check out my video to get the other five superfood products I am loving right now!